FADE is a free, fun way to share moments with college students around you – temporarily! FADE lets you share privately with your friends and people near you, and best of all none of your posts lasts forever. It makes broadcasting easy, with no regrets! Just like college, FADE is what you make of it! Unlike college, FADE is free. So basically it’s better. • Anonymous posting allows you to share freely. You get one “secret” Fade per day, so use it wisely! • Pictures say a thousand words! Snap a background pic on the spot or import an existing photo from your Camera Roll. Check your inbox, cause FADE now has direct messaging! Create your own unique username to send direct Fades, messages, and pics to your FADE friends. Type fast to claim your username! First come, first served. 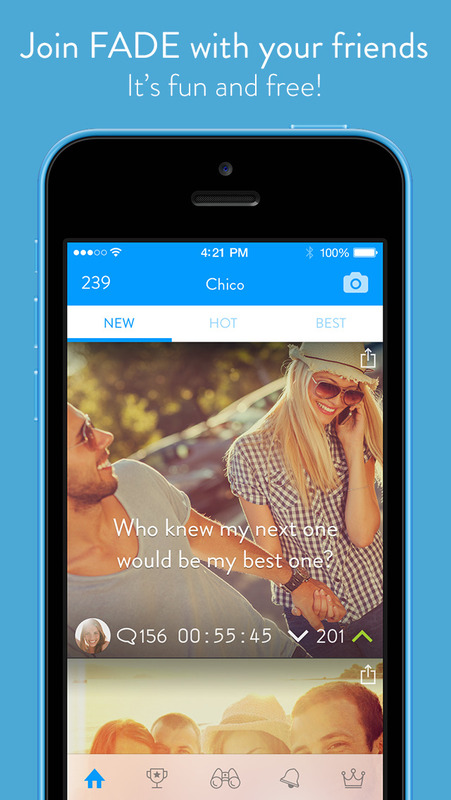 © 2014 Social Studio, Inc.